The cafeteria is a usual hang out for Morningside students. As I entered “The Caf” I was greeted by the familiar beep of students swiping their cards to enter the establishment. I took my usual spot in the first booth inside the dining hall where I could observe the entire room. I took a quick glance out the window. It was a particularly cool day with temperatures in the lower sixties but the sun streaming in and the flowers would lead you to believe it was a summer day. The all to usual smell of pasta bar was permeating the air and the general hum of the many conversations going was the music of the day. I was not planning on writing an observation about this room but then I heard the phrase that made my entire day. I caught the tail end of a conversation that I wish I had been a part of. “I like it when it’s cold outside because it matches the temperature of my heart,” he said. I had to use all of my restraint to not turn around and say “SAME! !” From there the room went back to normal until someone decided to turn on the song “That’s What I Like” by Bruno Mars which sparked a sing-a-long. The song then ended and the murmurs returned. Alex Watters, a first year advisor at Morningside College, says that even though he is paralyzed “I can’t sit still!” He keeps himself busy in activites that benefit the community because he wants to give back to a community that has done so much for him. Alex Watters is a first year advisor at Morningside College. He says he enjoys his job because he can see himself making a difference. “Some students are challenging cases,” Waters said, “It’s my job to give them the tools to succeed.” As an advisor he helps with the major change that is transitioning from high school to college. He said that a very rewarding part of the job was to see a student who was having a tough time with this transition get excited about college or a major. While talking about his job and other commitments there was a theme of helping people. He said that there were so many people that supported him through his accident he wanted to take any chance he could to give back. He spoke of the members of the Morningside community that visited him in the hospital as well as the nurses and physical therapists who’s job it was to reteach him basic skills. He said that there were so many people who gave back to him that he now wants to give back in as many ways as he can. One piece of advice that Alex Watters always holds on to is being told to have an “attitude of gratitude.” He displays that in his many obligations outside of his job at Morningside. He is a part of the city council and was elected Vice Chair of the State Rehabilitation Council. Though Watters enjoys his position he said it was not something he sees himself doing long-term. He spent time working in Washington D.C. where the norm for jobs is to move on every couple of years. He said he could see himself moving around within Morningside and maybe even becoming President of the College. Interesting technology news this week as Slate reports that Twitter is testing out a new, longer character limit. If this test works out they plan on giving a 240-character limit to their users except for those in China, Japan, and Korea. I actually looked for someone to be talking about this specifically because I had been seeing freakishly long tweets this week and was wondering what that was all about. I am excited about this news. I’m not a grammar nazi per say but as a former yearbook editor I don’t enjoy the way Twitter makes me use language that was very obviously wrong. The story reports that this change is meant to help people in countries that use more characters in their language express themselves more fully. The reason it isn’t being rolled out in China, Japan, and Korea is because their language uses fewer characters to express the same thing. As the story points out there is sure to be backlash over this change. People don’t like changes on social media. I remember just recently when Facebook changed to circular profile pictures everyone I knew freaked out because it was odd and different and now the banners don’t work well! I am interested to see if this change gets rolled out to everyone. I really want to have 240 characters in the future! The last person I spoke to before class was my roommate. We were walking to the library together because her work shift starts at the same time as this class. She is much taller than me already at 5’7″ and she was wearing heels today that were at least 4 inches tall which made me look extremely short. She was also wearing an oversized green hoodie over her Morningside T-shirt and a pair of jeans. Her hair is very short so it is always styled in the same way but today it was a little more disheveled looking as neither of us got up early enough to do our usual morning routines. Before we even left the room we discussed my choice of music for the morning. This happens pretty often but today was a more in depth conversation because I was listening to a song from the musical John & Jen which features the lyric “Dad says you’re a Communist” which was she found hilarious as she had never heard this song before. The conversation on the way to class involved the weather as it usually does. She is from Florida and any time it dips below 70 degrees we all hear about how cold it is. We also talked about how our first finalized acting scene has to be performed today in advanced acting class. Fun fact: neither of our groups are ready for that to happen. The conversation ended as we reached the library when I went to class and she went to work. I took a Pirouline and a donut from the table. I first grabbed one of the vaguely circular donuts. It smelled of chocolate and was covered in sugar that felt like sand. The donut instantly started shedding it’s sugar coating as soon as I picked it up and, like sand, it got everywhere. I initially did not have a plate so to avoid setting it on the table I put it on my laptop and it left a trace of something when I moved it. The Pirouline was a tube-like wafer stick filled with chocolate cream. It had a rough exterior with ridges made by horizontal rings that were invisible to the eye. Part of the outer shell broke off immediately as it was set on my laptop and again when it was put on the plate. It looked like a barber pole thats color’s had been replaced by a gradient of beige and browns. The outer coating had no taste on its own. The chocolate had a darker flavor than I anticipated which completely overtook the barely there flavor of the wafer. It vaguely reminded me of an E. L. Fudge cookie. It makes a loud crunching sound when you bite it which made me very anxious about eating it in class. As an actor you have to talk a lot in front of a lot of people however asking questions that you make up yourself is not really part of the job. Therefore going around asking questions of people I don’t know is, indeed, my worst nightmare. For this assignment I got one easy task and one hard task. I had to get an autograph and have a conversation about current news events. As there were three people in the KAC I could have just gotten my second task done there but if I was playing this game I was playing on hard mode so I decided to go to a different building. This proved challenging as most other buildings had people in class or in meetings. To add to the problem of finding people was the fact that I needed to talk about current events in the news and when you ask people about news they glaze over. Eventually I decided to try my hand in the music building. I am involved in the music department to an extent which is why I avoided it until a last resort. I want to go in to musical theatre so, of course, I take vocal lessons so I decided not to talk to any vocal instructors because I know all of them to some extent. What I realized was I had never really set foot in the music department office. Therefore I had never talked to Deb Protexter. She was sitting at her desk when I came in so I approached her and said “Hi! 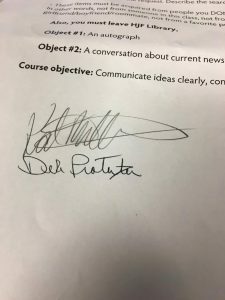 I’m doing a scavenger hunt for class and I was wondering if you had time to help me by talking about current news events with me.” She looked a little skeptical that this was an actual assignment so I showed her my paper and she said “Well, have you heard about that hurricane in Puerto Rico. It’s terrible. Is that all you need to know?” We talked a little about the hurricane and other hurricanes that had been happening. As I was leaving I asked for her autograph as well because I am an overachiever and figured it was an easy way to prove that this conversation actually happened and I didn’t make it all up. This week something funky was happening with my NY Times subscription as it was telling me I had reached a free article limit on my subscription so I had to look elsewhere for my news comment. So this week I went out of my comfort zone, NY Times Entertainment section, to… the BBC News Entertainment section. Currently in the news is backlash over the photoshop job on the new Tomb Raider poster. In the poster it looks like Alicia Vikander has an overly long neck and of course the internet snapped it up and made it a meme. The story goes on to relate it to other “poster fails” such as Pretty Woman and more recently The Heat. I think what I learned from this jaunt outside the Times is that other entertainment sections seem really shallow. In the NY Times, because it is based out of New York you get a lot more theatre, art, and dance news and a little less vapid celebrity news. My interest in the entertainment section is, more often than not, for the theatre news (not celebrity or Hollywood news) and that is why I usually read trades and type specific websites rather than a full on news paper. Overall the story was fine for what it was. It was a timely and interesting read that would keep the attention of a millennial because “OMG its a funny internet thing!” That’s just not the type of thing I enjoy. Four Armstrong Aeronautical University students were involved in a boating accident yesterday that led to the death of one. At about 5 pm yesterday the 16-foot catamaran boat that Randy Cohen, Christy Wapniarski, Daniel Perrin and Tammy Ennis were sailing in sprung a leak and capsized. None of the passengers were wearing life jackets. At dawn the group decided to swim to Ormond Beach four miles away. Wapniarski called for help claiming a shark attacked her and Cohen went to her aid. When he reacher her she was unconscious so he started swimming back to shore with her. Perrin checked her pulse when he reached them and found she was dead. Cohen swam with her for a while longer before leaving her behind. Cohen, who was bitten by dozens of Portuguese men-of-war, is being treated at Halifax Hospital. The others were examined at the hospital and released. A United Airlines flight carrying 61 people crashed in a residential district Friday afternoon while approaching Chicago’s Second City Airport killing most of the planes passengers. Media outlets are reporting that millennials are “killing” many industries and ideals such as lunch, Applebees, and napkins. The release of the Nintendo switch and the current onslaught of Hollywood reboots and remakes demonstrates that millennials are changing the the way advertising and the media conduct their business as they are now utilizing nostalgia marketing. Nostalgia is defined as a longing for the past. Every generation feels nostalgia at some point but millennials, or anyone born between 1981 and 2001, have proven to have a greater affinity for nostalgia. Abigail Wilkins of Brogan and Partners reports this could be due to the world in which they were raised. “They saw the effects of the recession at a young age and are in the midst of a difficult job market. On top of that, Millennials have been inundated with technology and the internet for a large portion of their lives,” Wilkins reported. Many major companies have brought back marketing tools from the generations childhood. As Digiday reports McDonalds has recently brought back the Hamburgler and KFC has brought back The Colonel as spokespeople in their ads. Digiday goes on to report that brands are also reviving products sold in the late 80s and early 90s. Among these are Coke’s answer to Mountain Dew called Surge and something called Crystal Pepsi. Hollywood has also seen a growing call for television and film franchise reboots. Shows from the 80s and 90s are regaining popularity thanks to streaming services and the internet and that resurgence in popularity has lead to shows getting new spinoffs or even straight reboots. As reported by The Guardian, shows such as Full House, Rosanne, and Will & Grace are returning to the airwaves through both streaming services and network television. Movies like Ghostbusters and It have been updated or remade for a new audience. Playing to millennial nostalgia has also permeated the world of theatre. Playbill reports that in the past ten Broadway seasons, forty news shows that have opened have been based on a movie from the millennial childhood years. The 2017-18 Broadway season will see the opening of Mean Girls: The Musical, Spongebob Squarepants: The Musical, and Harry Potter and the Cursed Child Pt. 1 which all cash in on this early onset nostalgia. I took my news from a different source than the New York Times this week as the title of this story intrigued me. That title is “Emma Thompson Still Regrets Turning Down That Date With Donald Trump.” This story actually flashed across my Facebook feed as some of my friends on the site like the Huffington Post and because of that I got ads telling me to like the page and this story just happened to be on one of those advertisements and it obviously did its job because it got me to visit the website to read more of this story. When I got to the story it was very basic celebrity news type reporting. Not a lot of story but enough star power to keep you intrigued no matter the lack of real content or story with it. This piece actually revolved around a video that went along with it so the actually written part of the story is very short. The lede does a pretty good job of summarizing the main points in case that is all someone reads before just turning to the video. Personally I found the story very interesting, topical, and had a novelty feel even in celebrity news. It has been a week since I left on the trip of a lifetime with two of my closest friends and fellow theatre majors Amy and Annalee. We made the crazy decision to take 4 days of our lives and do what everyone said was crazy: drive halfway across the country to see an off-Broadway turn around and come home. When we began planning this trip everyone told us that this was impossible and that there was absolutely no way this would be fun for us. We had to drive 20 hours to have one afternoon in the city. I didn’t care. I was going to see my idol in a show that I have loved for so long yet had never seen live. I had my doubts, yes, but I was all in for this to work and so were Amy and Annalee. Looking back there is nothing I would have changed about my experience. We had just enough time to do everything we wanted. We wandered the city we all plan to call home in just two years time. We saw the marquees for shows we dream of being in. We built our friendship. I met my idol. And, most importantly, our loves for theatre were further enforced. I am sure people are getting tired of me talking about this experience, but I don’t see an end in sight for my excitement. I have always wanted to go into theatre. I love the freedom, the creativity, and the community. When we sat down at that table to see this show we were part of a family. Our table got to know each other, the actors who talked to us pre-show talked to us about our lives. One of the actors said she looked forward to working with me when I made it to NYC and I feel like she actually meant it. 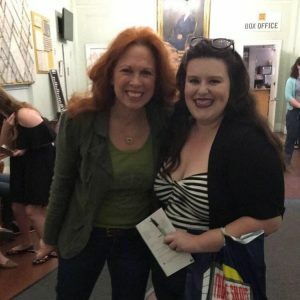 Even when we were making giant fools of ourselves in front of Ms. Carolee Carmello herself, someone I have idolized and dreamed of meeting since middle school, she was gracious and welcomed us into this theatrical community they created. If I was 100% sure I was moving to New York to pursue professional theatre before the trip I am 300% sure now. Everything I saw that day just made me want to become the best actor I can be to make it to where I can inspire someone with my performance as much as the ENTIRE cast of Sweeney Todd at The Barrow Street Theatre inspired me. Now here is a picture of me with Carolee Carmello again because I still can’t believe this moment I have long dreamed of has happened!! !